It's not exactly the Grand Canyon or Mount Everest, but by Latvian standards it's not bad, and by any standards the Zvārtes iezis (Zvārte rock) is certainly picturesque. Sandstone cliffs looking a bit like an enormous chunk of smoked cheese, of the “hunter's cheese” variety popular in the forests all around, rise 20 metres [check] above the gentle and shallow River Amata, which chuckles as if being tickled by the grass and willows along its banks. The Zvārte cliffs themsleves seem to quietly crumble before your eyes and on a warm early summer's day the whole scene radiates a heat that could set the coldest heart purring like a cat. Jānis Splīte is waiting in the car park at what could be called a popular tourist destination were it not for the fact that despite the perfect conditions and free entry, we are the only ones here. “We can pretend we drank them,” I suggest, and as we walk through a meadow, across a little wooden suspension bridge and up the edge of the rock to the view point at the top, Jānis tells me about the company he works for, Ekju, and why he chose to meet at this idyllic spot. “Our factory is not far away from here at Ieriki and Zvartes iezis is one of the nicest places in the whole of Latvia. We are a nation that is known for having a flat country – so we like things that are a little bit higher,” he chuckles in a voice as jolly as the Amata's. Ekju is not some newborn startup. The company started in 1992, just a year after Latvia regained its independence. The name derives from the first names of its four founders: Egons, Klaus, Juris and Uldis, with Jānis joining soon afterwards but sadly not being awarded another letter in the company name. After building a saw mill in an old army depot, the main product initially was roof slats and timber for construction, but as Jānis explains a little breathlessly as we start to climb up a hundred or so steps, it quickly became clear that value-added products made more sense. Until recently, most of Ekju's output was on a contractual basis: they would make the furniture to be sold under the labels of retailers, mainly in Western Europe, with more than 95% of products going to export, but now the company is also using its experience to develop its own brand on the market with the help of a Danish design consultancy. That fact alone shows how Ekju's growth has coincided with, and been accelerated by, a massive increase in the market for garden furniture in recent years, particularly in countries like France (the biggest market at present), Spain, Belgium, Ireland and the United Kingdom. When spending time in the garden becomes fashionable rather than a source for just potatoes and backache, a barrel and a bucket will no longer do for outdoor furniture. Ekju's range includes everything from benches, tables and chairs to raised flower and vegetable beds, pergolas, sandboxes and even rabbit hutches. 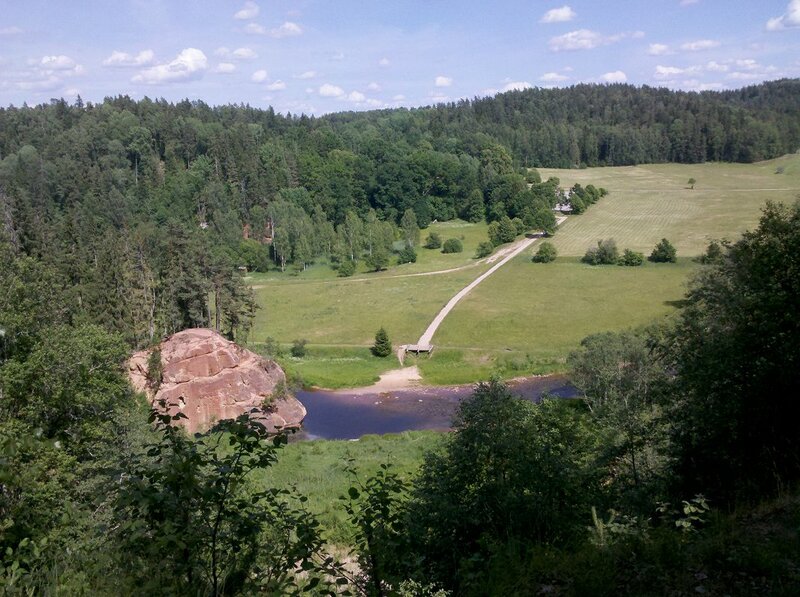 And now we are on top of Zvārte rock, looking down at what is quite literally a picture postcard scene below us: river, forest, meadow and an old barn with a shingle roof. It could not be more typically Latvian. As this suggests, the company places great emphasis on its commitment to sustainable forestry, using only FSC-certified sources and planting thousands of trees each year to replace those it harvests in Latvia. We descend the hundred steps, cross back over the bridge, pass through the meadow and are back in the car park, where we pretend to drink our beers. If only there was a bench to sit on.